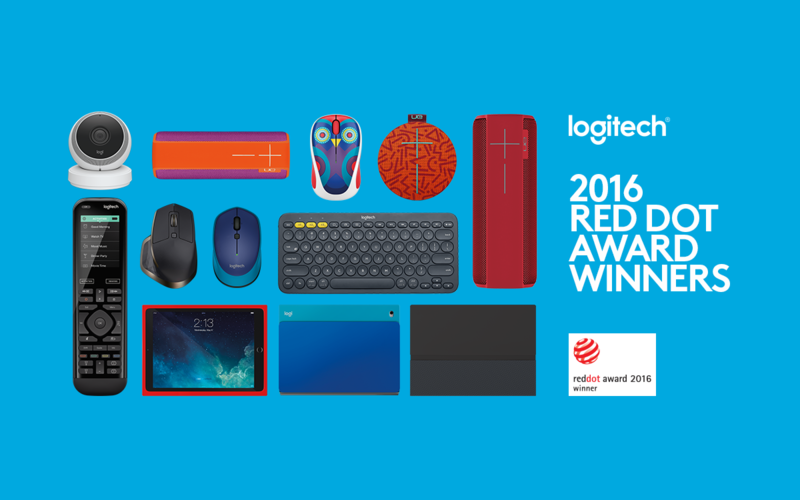 Logitech design awards keep rolling in this year; now, with an unprecedented win of nine product design awards from the internationally acclaimed competition, the Red Dot Awards. With three more wins than 2015, we surpass company records with our highest number of Red Dot Awards in a single year. This also marks the fourth consecutive year that we’ve been recognized in the Red Dot Award: Product Design competition. With design at the center of our company focus, we’re thrilled that almost all Logitech product categories are honored by Red Dot, with awards going to the Logi® BLOK Family of Cases for iPad Air 2, the Logitech® MX Master Wireless Mouse, the Logi® Circle, the Logitech® K380 Multi-Device Bluetooth Keyboard, the 2015 Logitech® Play Collection, the Logitech® Harmony Elite, the Logitech® M335 Wireless Mouse and UE ROLL, as well as the Ultimate Ears family of speakers comprising of the UE BOOM 2, UE MEGABOOM and UE ROLL. The Red Dot Awards: Product Design 2016 were selected, based on a 41-person jury, who reviewed a record number of 5,214 products from 57 nations. The jury consisted of independent designers, design professors and journalists, who judged based on strict Red Dot design statutes to appraise the best products of the year.